Last week’s Five Favourite Friday will actually be on a Monday! My gosh, I’ve really let myself go haven’t I?! Friday, I went out for Birthday cocktails with my sister (OK, it was 3 cocktails and I was tucked up in bed by 10:30!). Then Saturday Tim took me and Alex to Chester to do some shopping and play some Pokemon Go as part of the anniversary festival that was taking place all over the world. And, finally, yesterday was my birthday! I am now 21 again! Just kidding! Anyway, all that excitement, coupled with a lot of NVQ work needing to be done has meant I simply didn’t get chance to do last weeks top 5. The topic was Disney Songs (which was of course chosen by me) and I was really looking forward to this one, so I just decided to post late! And so, here is my top 5 Disney Songs! 5. Once Upon A Dream (Sleeping Beauty, 1959) – There’s just something about this song. It’s beautiful, yet haunting. 4. I See The Light (Tangled, 2010) – I’ve only ever seen Tangled once when The Girl Gang had it on one of the Movie Nights. But I’ve been listening to the song for ages and I love it! Very girly, very pretty and very romantic! 3. Friend Like Me (Aladdin, 1992) – The late great Robin Williams was the perfect genie and it when listening to this song it really shines through. I just hope that a) they keep this song in the live action remake and b) that Will Smith does it justice. 2. Under The Sea (The Little Mermaid, 1989) – I loved The Little Mermaid when I was younger. I always wanted to be Ariel and have Flounder a my best friend and be able to sing and dance to this little number by Sebastian the crab! A girl can dream, right? 1. Where You Are (Moana, 2016) – This one was a really tough choice. In all honesty I would have liked to have had the entire Moana soundtrack as my number 1 but then it wouldn’t be Disney songs, it would be Disney albums! Off the whole album, I have 3 favourite songs, but this is my most played so it had to be my number 1! An honourable mention this week goes to Hawaiian Rollercoaster Ride from Lilo & Stitch. Moana and Lilo & Stitch are my 2 favourite Disney films and Hawaiian Rollercoaster Ride was definitely joint first, but as I could only choose one, I thought I would make an honourable mention for this one. Also, honourable mentions go out to the classics (A Spoonful of Sugar, Just Around The Riverbend, Circle of Life etc.) as they are timeless and will always be the best of Disney. On Friday this week, Tim has decided that we will be looking at our top 5 MCU (Marvel Cinematic Universe) Characters. I’m actually looking forward to this one! 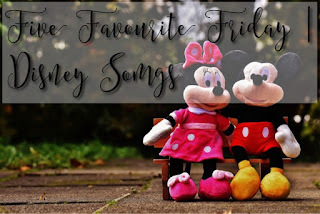 In the meantime, why don’t you let me know in the comments what your favourite Disney songs are? Previous Post Je vais à Paris!